A dog that will trust enough to jump directly into his handlers arms is a happy dog. This trick will consist of your dog jumping up into your waiting arms whilst you catch him. This is a nice stand-alone trick or good as part of a longer routine. Begin small to build both your own confidence and the ability of your dog. Offer your dog something nice like a treat or a toy and hold it above his head, at your chest height, encourage him to jump and take the reward. Next encourage your dog just to jump to your hand without a treat or toy and reinforce then reward when he does. 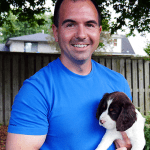 Now bring your arms into your chest but still reinforce and reward the jump and at the same time catch your dog. Repeat a few times until the dog is completely confident to jump into your arms when asked. Top tip; you can begin to train this trick by sitting on a chair and progress to standing if your dog is worried. Clapping and raising your dogs excitement will also encourage him to jump. 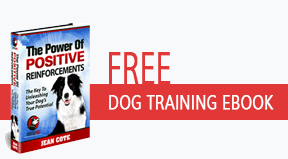 Dog trainers love this trick because it enhances trust in the relationship with their canine. I have tried by starting out with sitting on the chair, but my dog only just stands up an pits its front paws on my lap.